We have collected vintage tea towels, pillowcases, tablecloths and clothing. Usually we have procured these items from tag sales, thrift stores or antique shops. 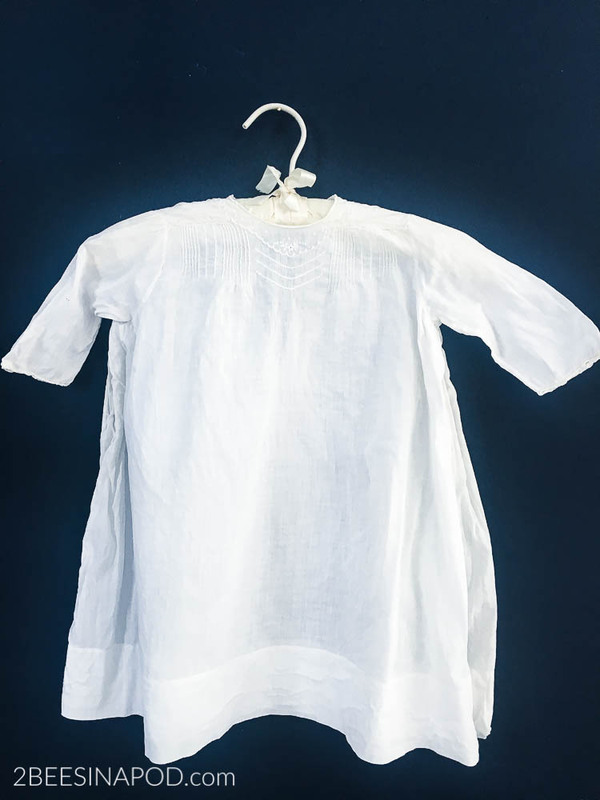 Sadly, most of the white fabrics are heavily stained or yellowed from improper storage and time. 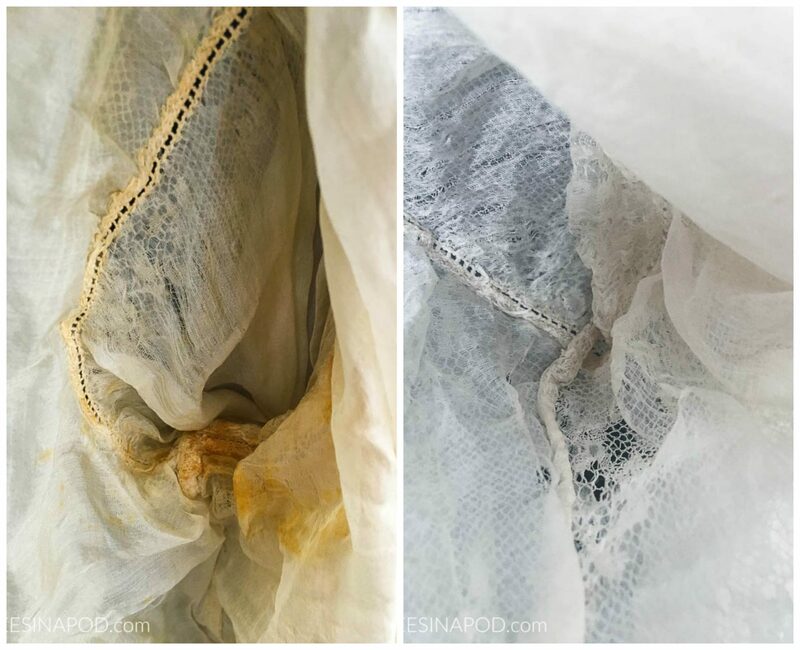 This is how to clean vintage linens and fabric. 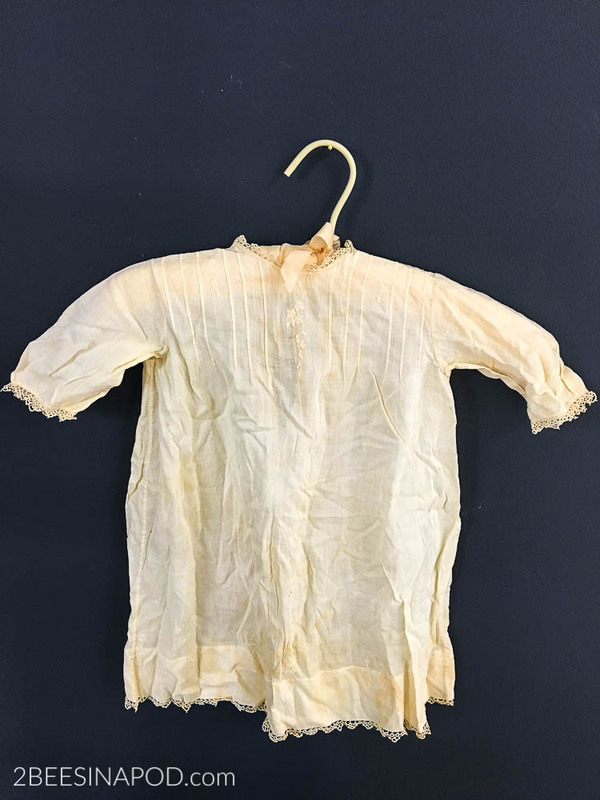 Have you ever held a piece of vintage fabric or linen in your hands? Typically the fabric feels buttery soft. It goes without saying that these fabrics have withstood the test of time for good reason. Fabrics were better-made, high quality and more than likely the piece itself is handmade. 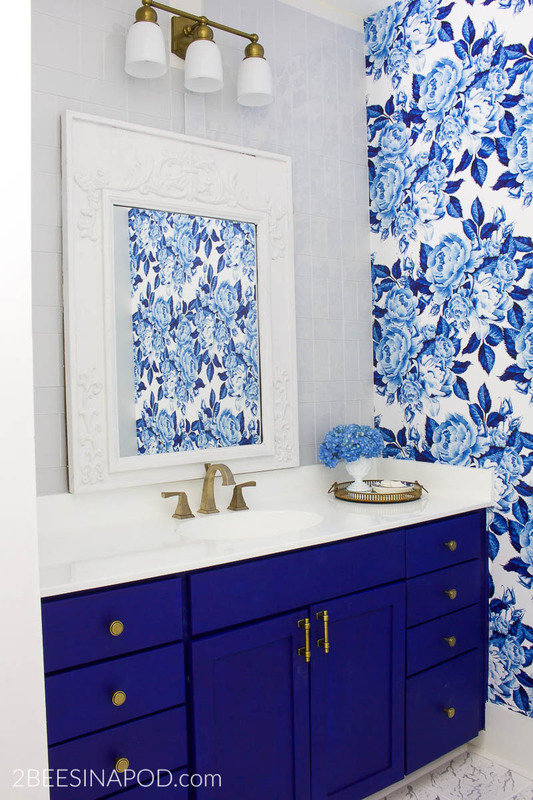 Caring for vintage fabric is important, especially if you want to display them. 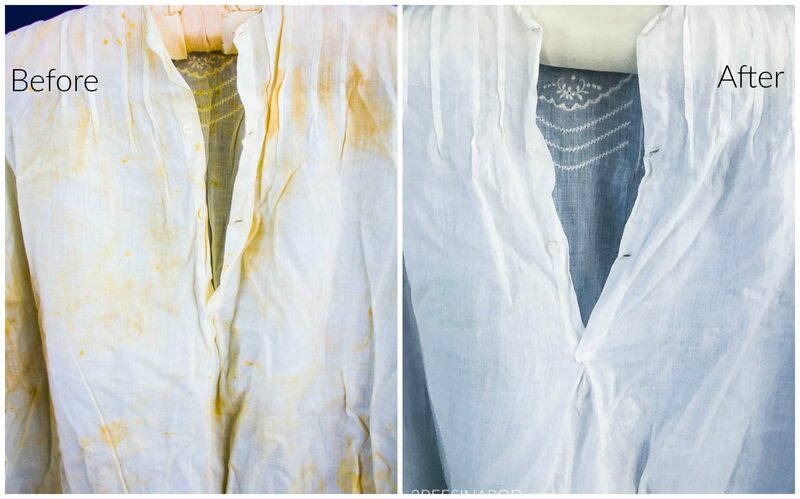 This is how to clean vintage linens and fabric. We are not experts, we are sharing a cleaning method that works for us. Determine how invested in your vintage linens you are. 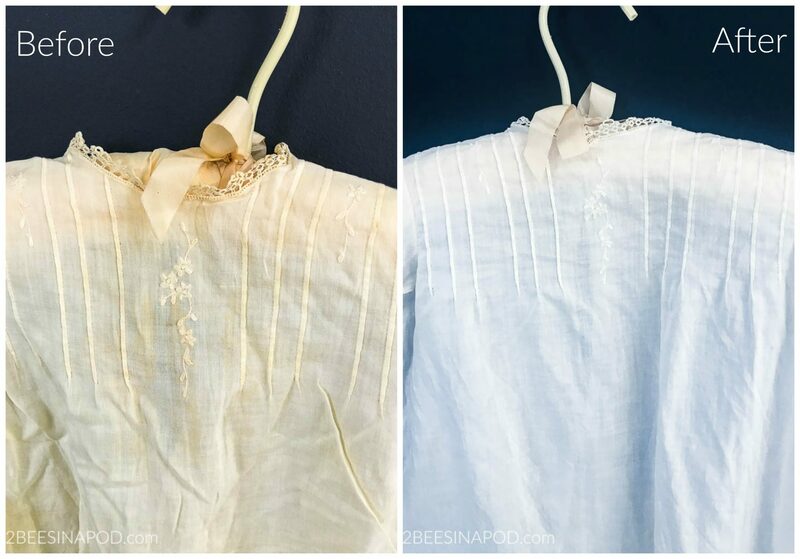 Are your pillowcases inherited from great-great-grandma or did you purchase them for $1 at a tag sale? What condition is your piece in? Are there holes in it? 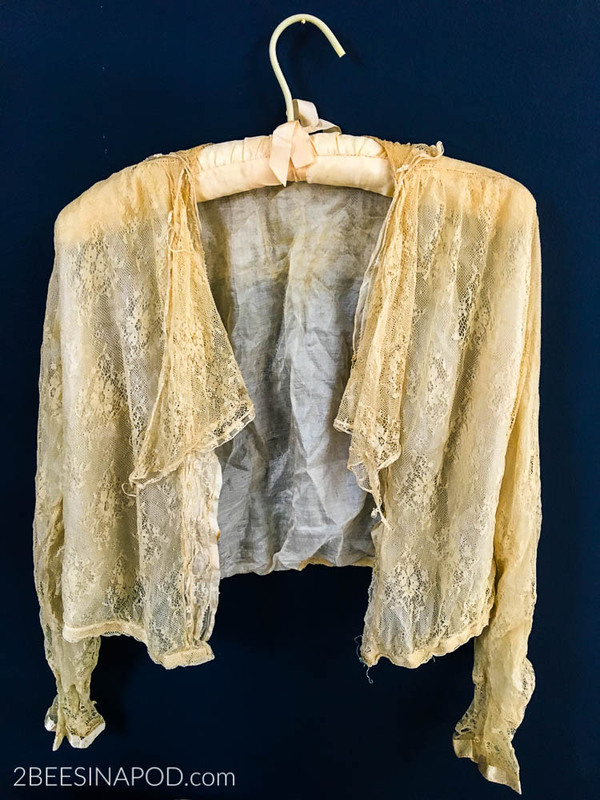 Is the fabric rotten from age? Or is it already falling apart? After weighing the pros and cons, here is something else to consider. 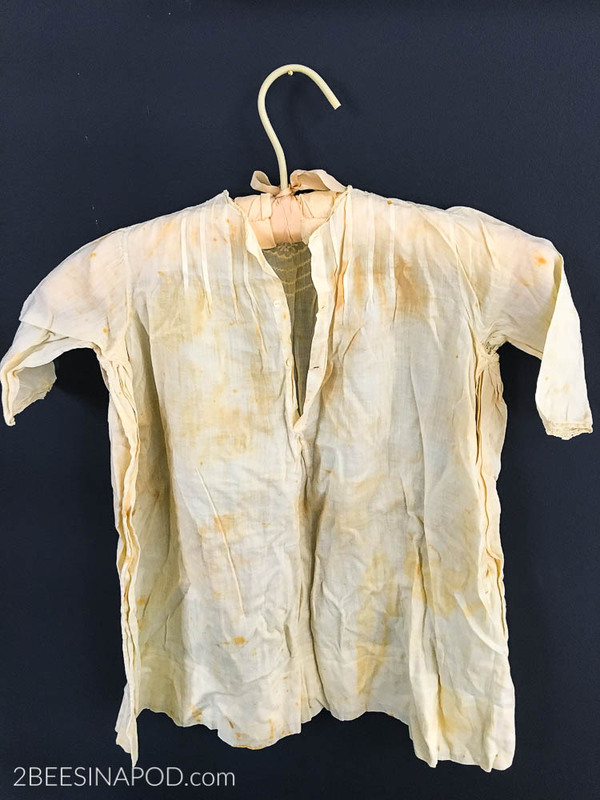 Are you really going to display or use your vintage piece with the gross yellow and brown stains? 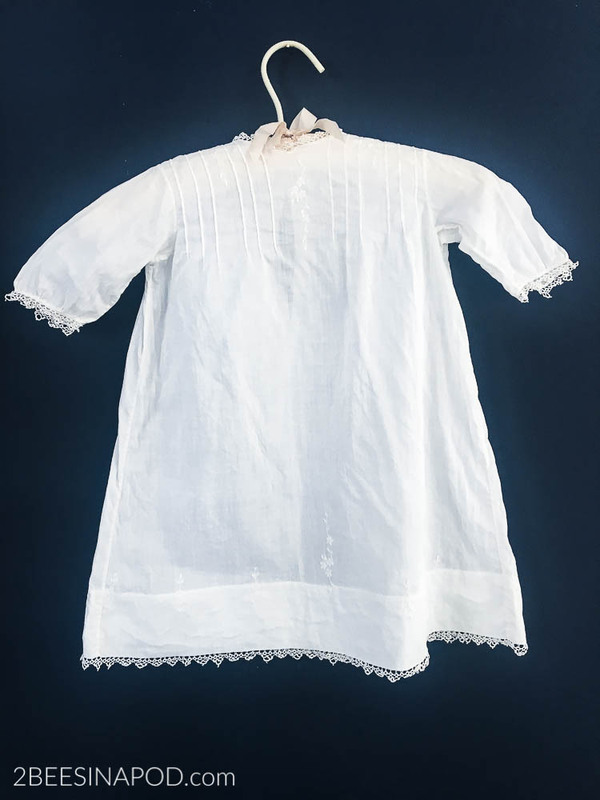 For example, take a look at this baby gown. We wouldn’t showcase this in our homes either. That’s why we promote taking a leap of faith in cleaning our vintage fabrics. Otherwise a vintage baby gown like this would just be stowed away in a closet or box and forgotten about. Last week these vintage pieces were purchased at an estate sale for just $5. 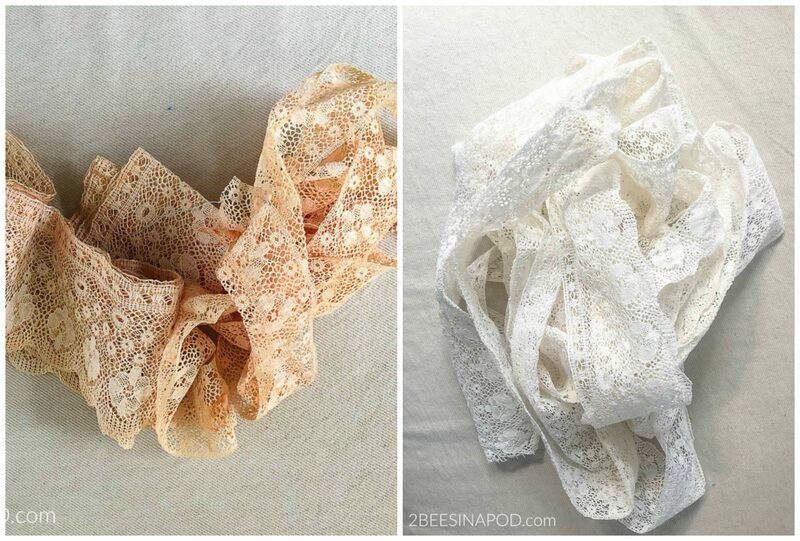 That’s just $5 for 2 baby gowns, a lace blouse, a lace camisole and two yards of vintage lace! We were told that all of the clothing and trim were from the late 1800’s. 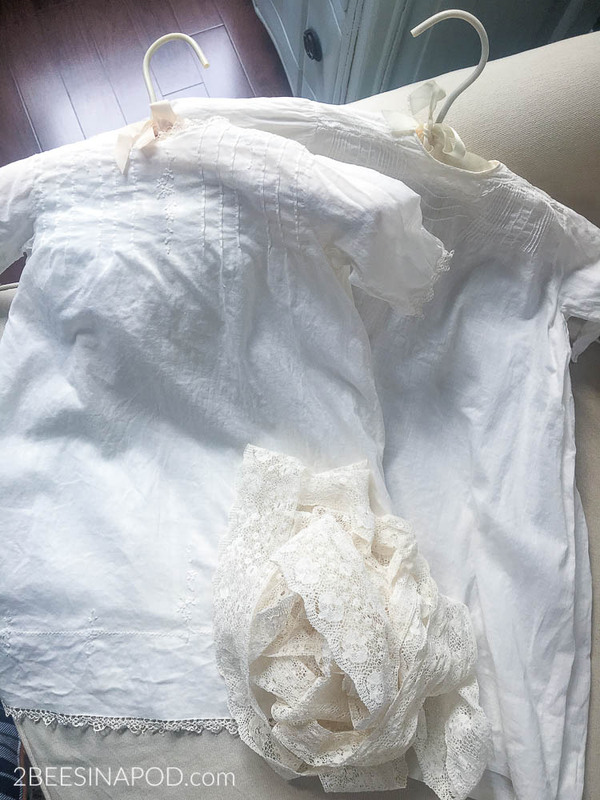 The baby gowns and lace had the most stains on them from age and years of being stored in a box. We decided to tackle these items first. Read all directions before starting. 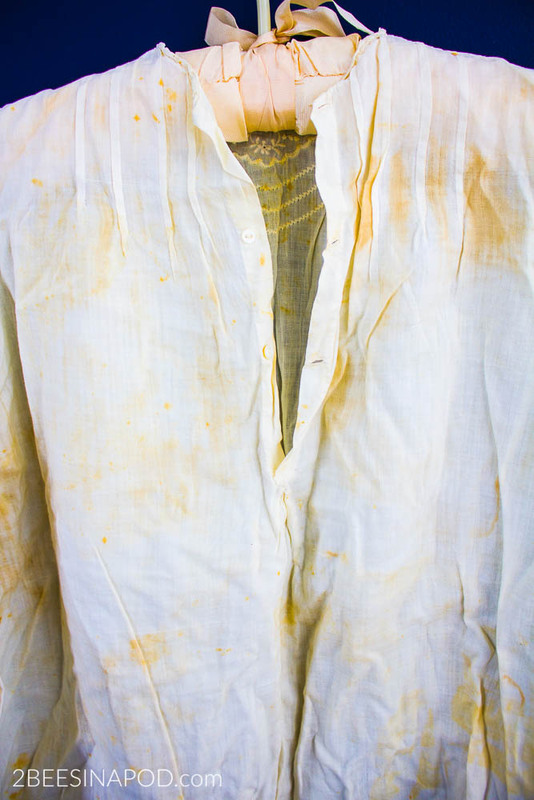 Use safety and caution when boiling water and adding OxiClean. 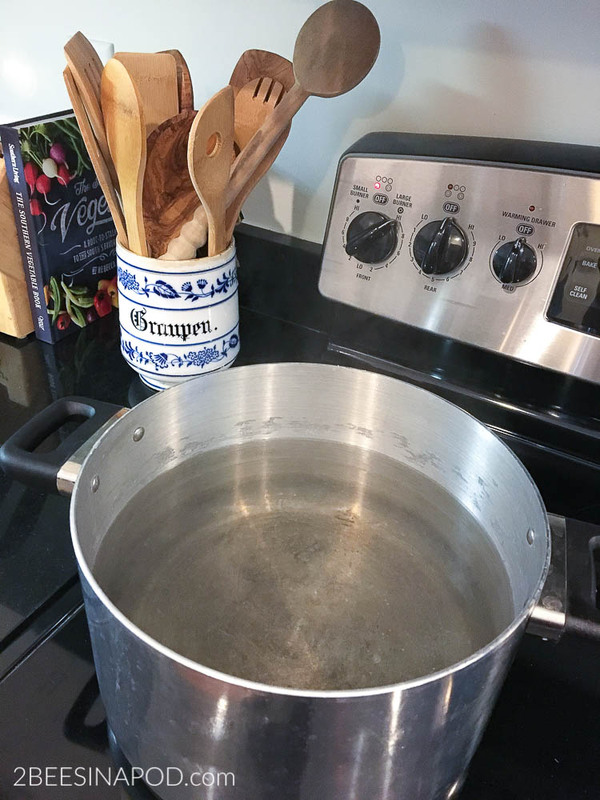 Fill a 6 -8 quart pot of water, ¾ of the way full and bring to a rolling boil. Remove pot from stove and take it to the bathtub or shower. Be sure to place it on a folded bath towel. Carefully add 2 scoops of powdered OxiClean – keeping your face away from the pot. When you add the OxiClean the pot of water will bubble and foam over. Only do this in the bathtub or shower. Add vintage linens or clothing to the pot. 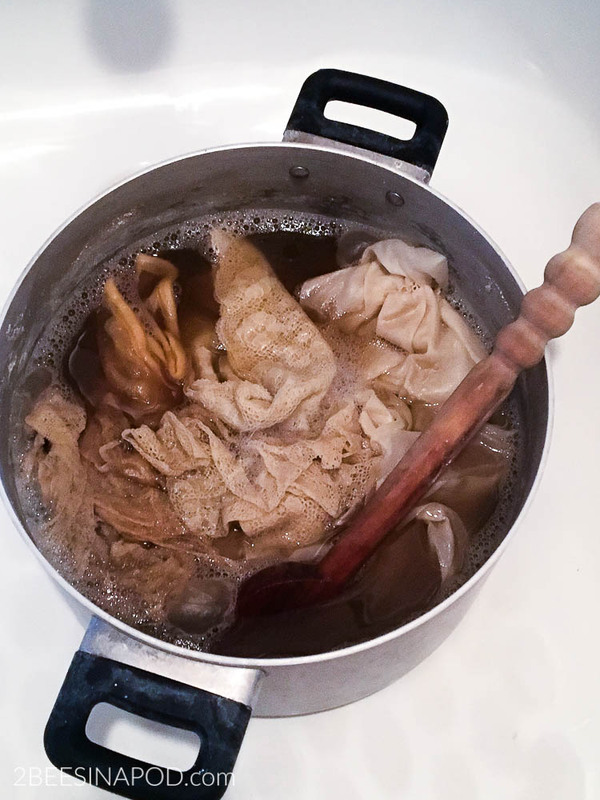 Using an old wooden spoon (not to be used for food or cooking)gently pat down the fabric into the hot water. Do not stir or pull fabric. After one hour, empty the dirty water and gently rinse the clothing. Leave clothing in the OxiClean for 5 hours. Empty the pot and rinse clothing. 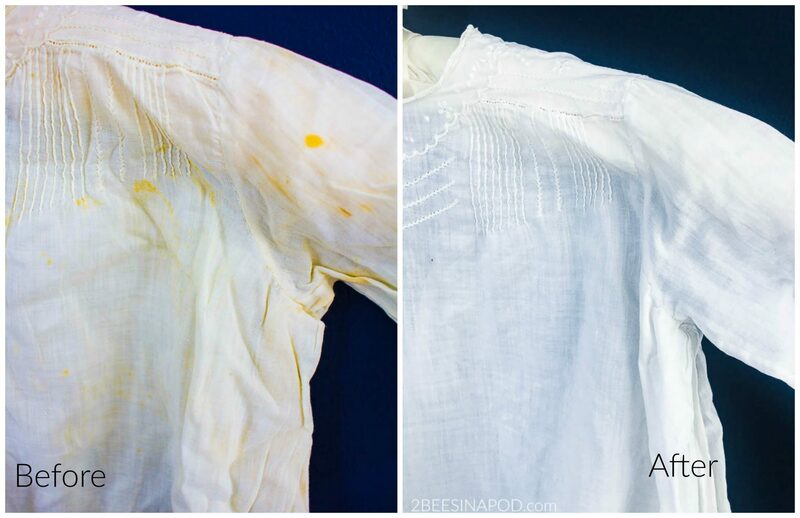 Check to see if stains are all removed. If not, repeat the cleaning method. For us, all of our items were cleaned. Lay the linens, clothing or fabrics flat on a clean white towel. Allow to air dry. Boil the water on the stovetop but do NOT add OxiClean until the pot has been moved to the bathtub or shower! 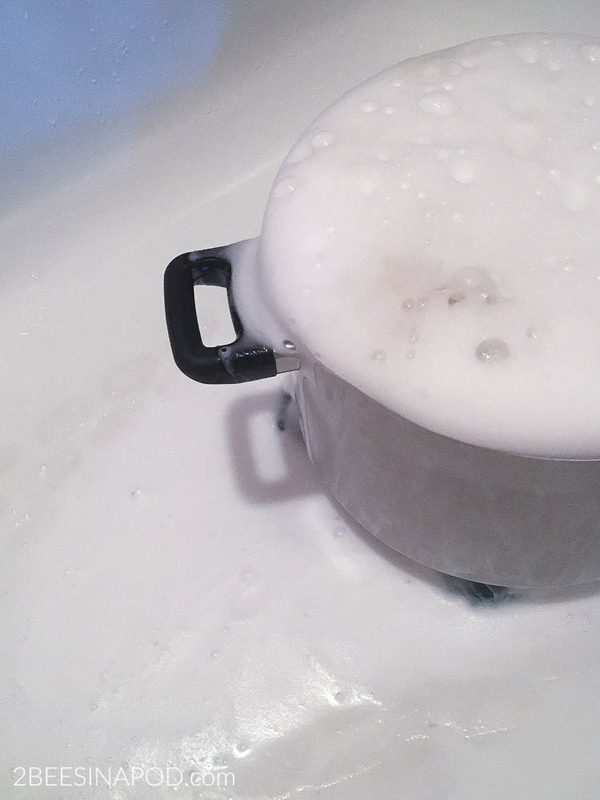 This is a photo from an iPhone, but you can see how the OxiClean foams over the sides of the pot. Remember, only add the OxiClean after the pot of boiling water is placed in the bathtub! OxiClean does not contain any bleach of chlorine. The active agents are hydrogen peroxide and a salt compound.This is what the water looked like after just one hour – yuck! 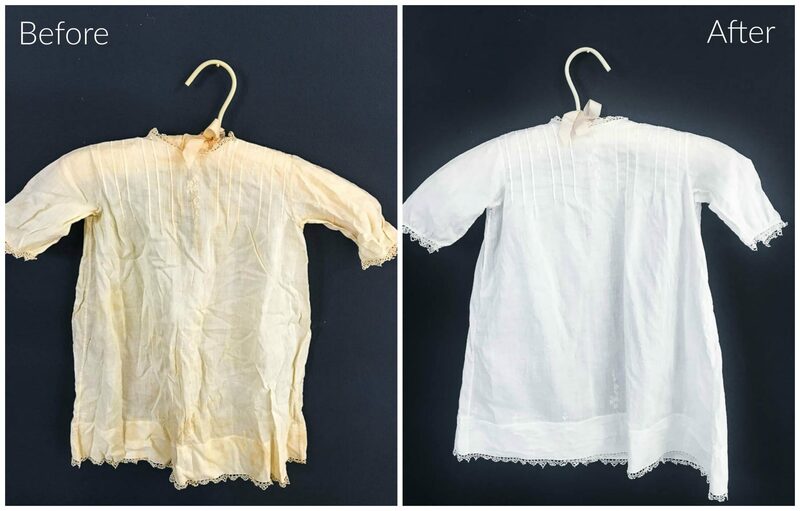 These precious baby gowns have been saved from ruin. 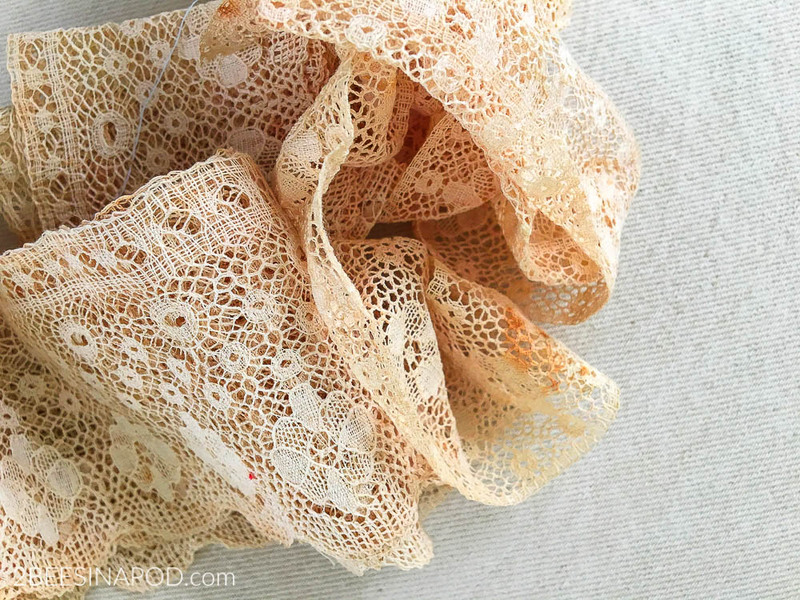 Normally we would never boil lace, especially lace that is over 100 years old. But then we remembered that boiling clothes was how laundry got done all of those years ago. 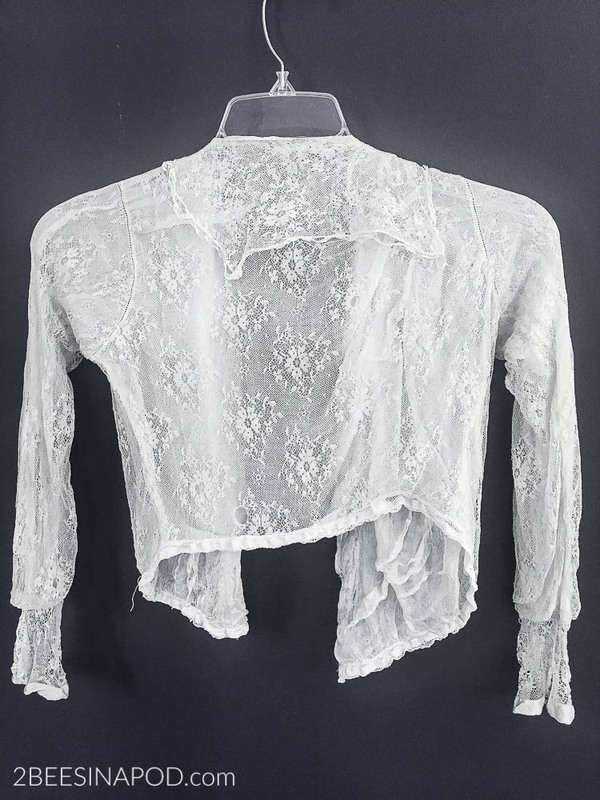 And the lace blouse and lace trim were in such very bad shape we decided to give a try. 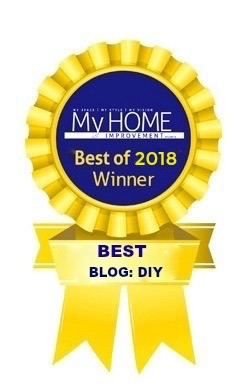 We are so glad that we did! 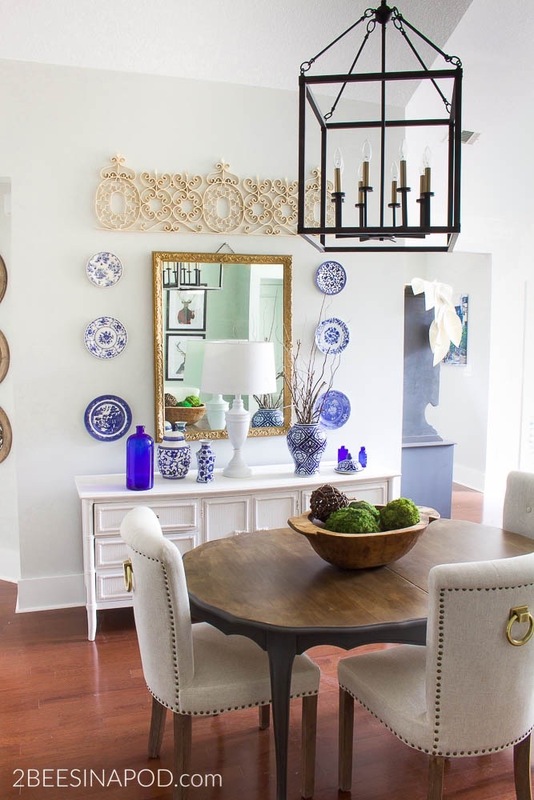 All of our pieces look beautiful now and we would proudly display them in our homes. 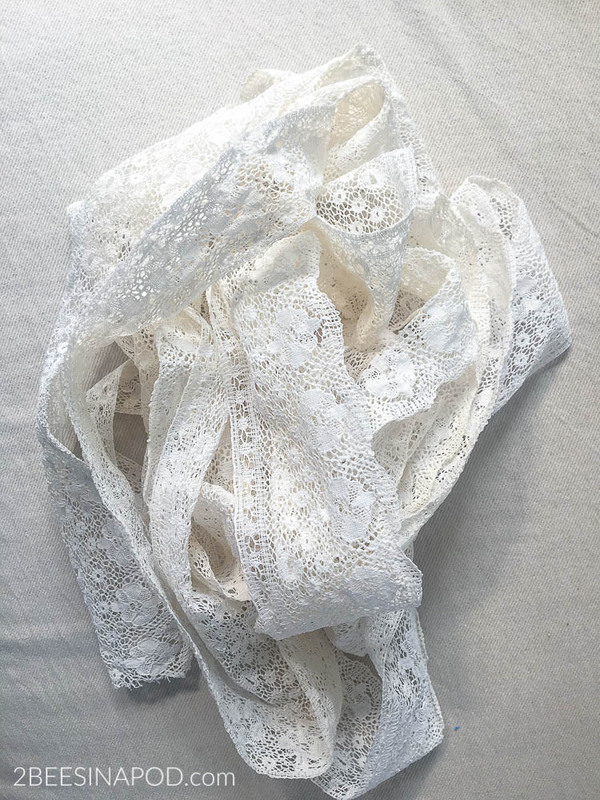 We hope that you have found this tutorial for how to clean vintage linens and fabrics helpful and informative. 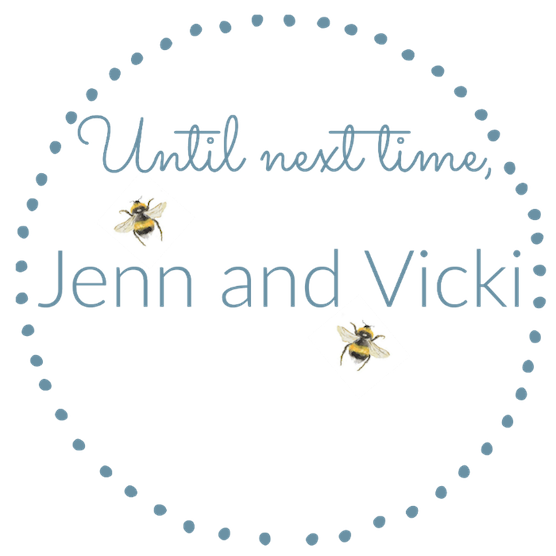 Keep us informed of your success in cleaning your vintage linens. These pieces look great and the process seems straight forward, just requiring patience! Thank you so very much! Yes, we hop that you give it a try! 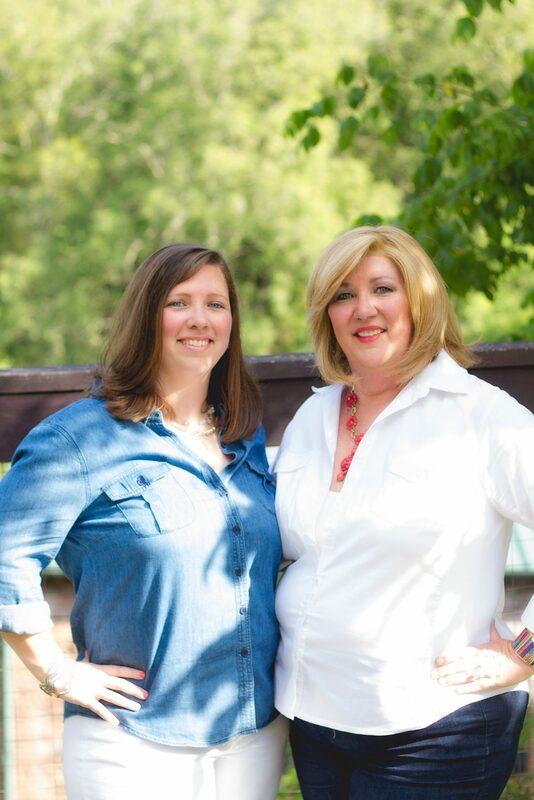 We appreciate you following along! Wow! What a great transformation. Nice and thanks for sharing. Will have to try that sometime. 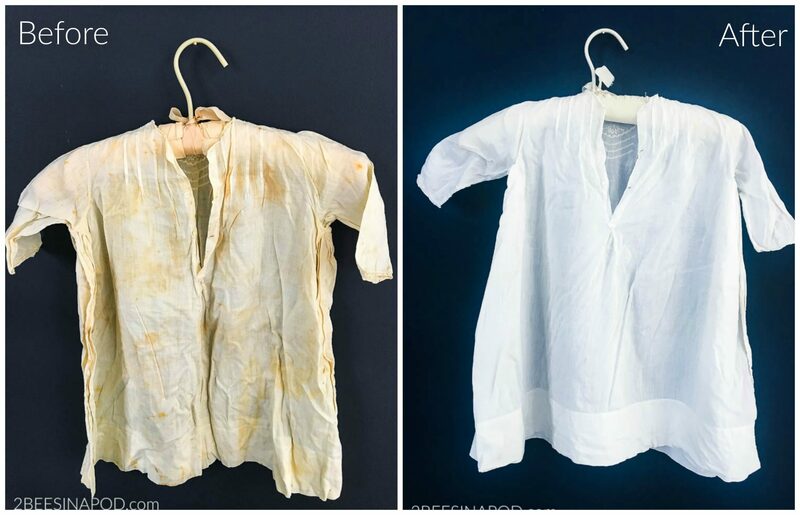 I have used Efferdent tablets from the dollar store in a pot of warm water and soaked my baby gown and some other items all night moving them around in the pot periodically and they turned out nice and white also. Thanks for your great suggestion of Efferdent tablets. We will definitely give that a try! We are also experimenting with kosher salt and lemon. It’s wonderful to be able to clean this vintage pieces. We will be looking for more of them and hope that you do too! 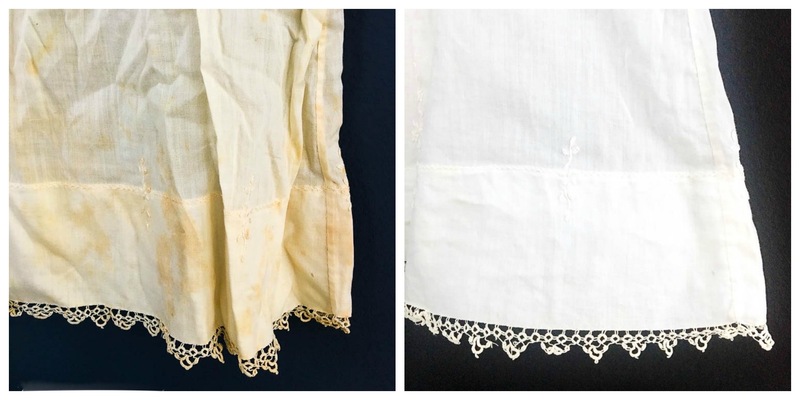 We are thrilled with this cleaning method for vintage linens and fabrics! We can’t wait to find more bargain-priced items now that we know how to properly clean them and make them look new! Wish we could shop together! Wow!! 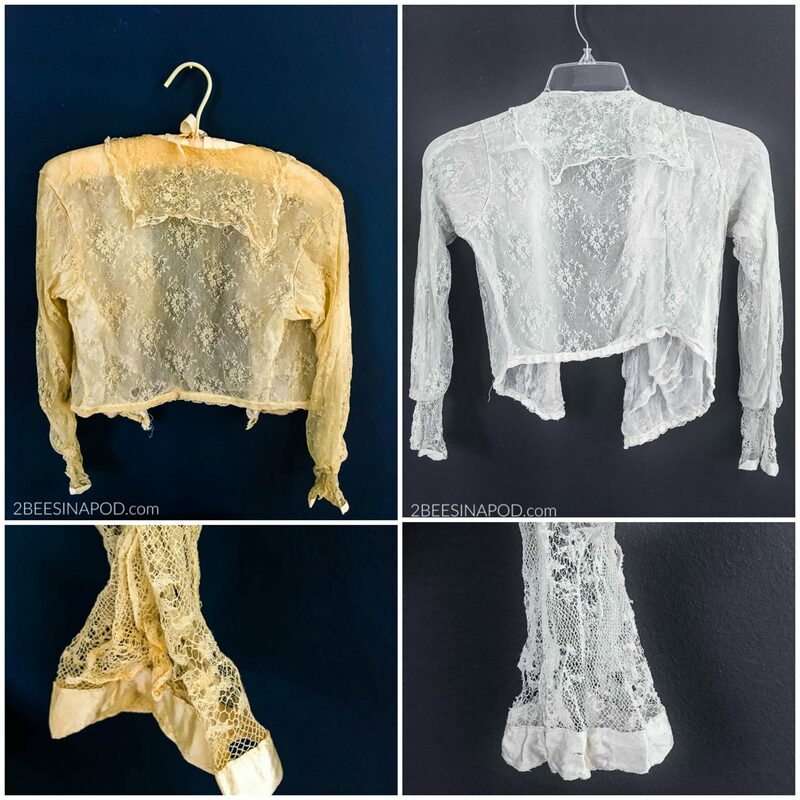 I saw those beautiful vintage garments in person before their AMAZING transformation back to life. The transformation truly is unbelievable. 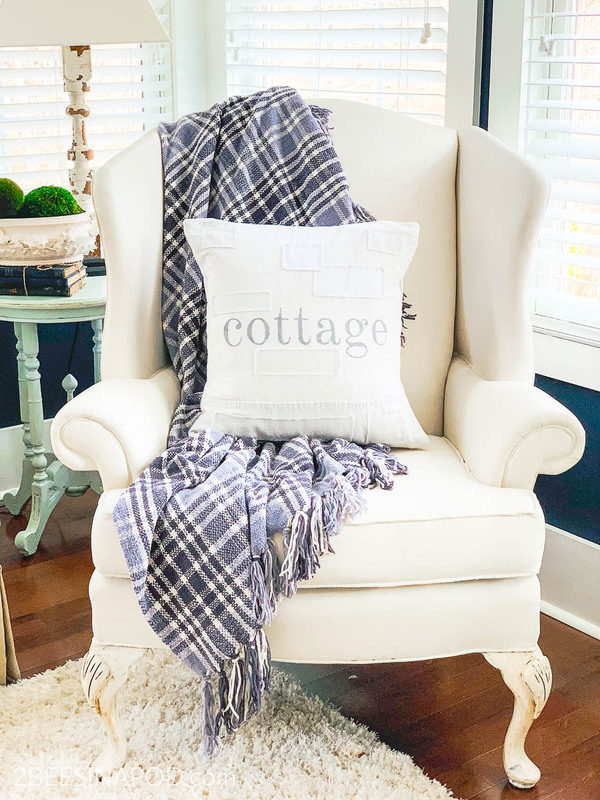 Now we want to go out and find lots of inexpensive vintage linens that need some TLC! 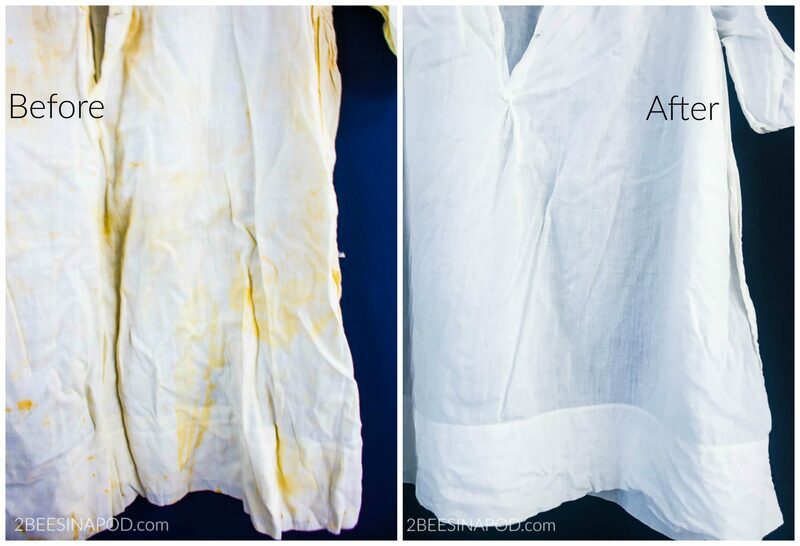 I’ve used OxiClean for years on every type of fabric, color and pattern. “The soak” has never damaged anything. It’s an amazing product as well as being inexpensive. It’s a treasure! This is great news! Don’t you just love it when a product works so well? We know that we do. Now we are on the hunt for inexpensive, vintage fabrics since we know how to remove the stains now. Thanks so much for sharing your experience. We greatly appreciate it! Thanks a lot for this great post. I was looking for a solution, and I think I found it. will try out OxiClean and see how it works out. Cheers! Quick question: does this method with hot water work also with cotton which usually requires cold water? Thanks! Hi Caroline – We have had success using this method on cotton pieces. Please keep in mind however that the pieces that we do work on are in very bad shape and have not cost us much money. If your piece is of sentimental or monetary value, you would need to decide if you want to use this method. If you do – then we recommend that you do a test on a very small corner first. ?Hope this helps! Read with much interest and delight your tutorial. Many years of bringing the old lovelies back to life. I used Biz and kosher salt in the past but will do your method from now on. One thing. I learned from a “restorer” that you need to rinse the item 16 times! (Yes) and the final rinse in distilled water to get any rust that might be lurking in your tap water that might come back to haunt you. So if you don’t want to bother with the 16 thing just do the distilled water. Yes, we love restoring these beautiful pieces too! We are shocked at the “16 times” suggestion LOL, but a homeowners with hard water – this might be a good idea. And we definitely love the suggestion of distilled water! Seems so very smart. Thanks so very much for passing along this good info. We appreciate it so very much!